We returned back to the dungeon, minus Stig (where is he!) after a short stay in Dregg, there followed a wild day of combat and although we managed to find the long lost legendary magic sword, the cost of this adventure was perhaps nearly too high for me. Clearly my new companions are either more experienced and able or just lucky, as I nearly succumbed to wounds of which, one was almost fatal, a touch from an undead warrior seemed to drain the very life blood from my body. Due to quick thinking and action, I was saved by the Necromancer who cast a return from deaths door spell, I am in his debt and grateful to both he and the Cleric of Hegg for saving and healing me. The Wizard also needs mentioning, as he enabled our save withdrawal as he fired a lighting bolt from his wand and fried the last two Wights who were pursuing us. Where is Stig, perhaps his presence would have resulted in a better experience. I now know why Uncle Nori insisted on him joining me. I must write to Nori and let him know of his disappearance, it is most inconvenient, Nori will not be happy. After meeting an adventuring party in the local Ale House in Dregg, I have decided to take my manservant, Stig along with me to help do some salvaging in a nearby dungeon, in the middle of the magical forest of Harln. A magical sword has been mentioned along with other opportunities for loot. It will be good to get underground and away from the prying eyes of these town folks. Not sure what to make of this rabble yet, I wonder whether I can trust them, but one thing is for certain, it does looks like they need the strong arm and intelligence of a Dwarrow. After a heavy day of combat, where I hope I was able to show my worth to my new companions, we returned back to Dregg with a few hundred gold pieces and some precious metals to cash in, not a bad start. Some time ago I posted a couple of session reports from the very beginning of my Labyrinth Lord campaign. I enjoyed writing the reports, but to be honest, when I sat down to write something game-related, session reports were at the bottom of the pile of things to do, so I didn't keep it up. Recently a wave of new players have joined our group, taking us from a meagre and somewhat tenuous count of 3 or 4 to a mighty sum of 8 or more! One of these new players, Steve, has been writing some excellent campaign logs from the point of view of his character, Deepingdale, 1st level Dwarrow. So I thought it'd be nice to share these logs here, for anyone who enjoys reading such things. I don't know how many session passed between the last log I wrote in January, and Steve's first log, but I'd guess maybe in the region of 8 to 10. 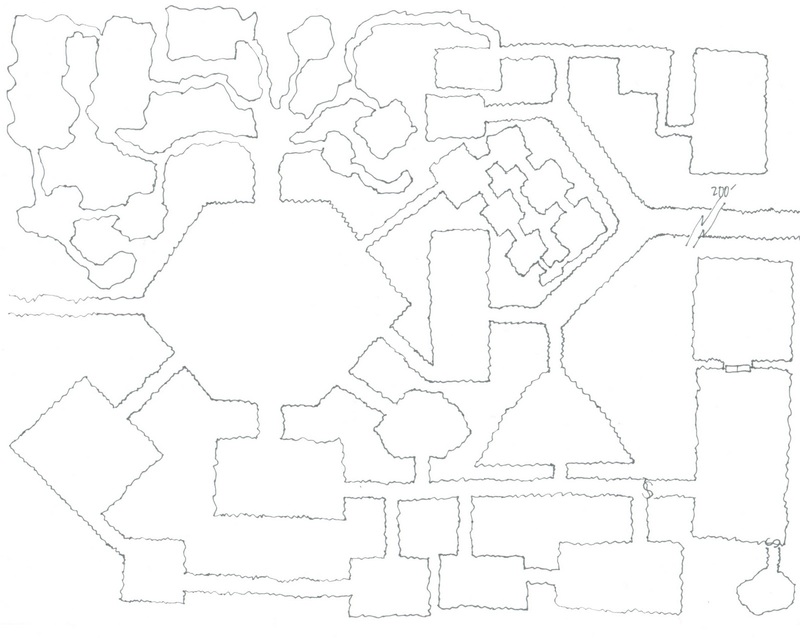 I just had an interesting idea for how to manage the map & key for an evolving dungeon. The assumption is that each time a bunch of adventurers go in there and cause trouble, a substantial number of facts about the dungeon (e.g. what monsters live where, what treasures exist, and so on) will be altered. 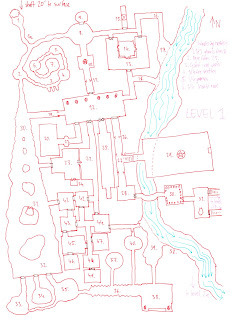 Traditionally I've had two separate things: 1. the dungeon map with numbered rooms, 2. the dungeon key, describing what's in each of the numbered rooms. I've found that two problems arise with this system of separate map and key. Firstly, the simple issue of having to flick back and forth between various sheets of notes, and of having to correlate the map to the descriptions. Not a huge deal, but there might be an easier way. Secondly, the problem of what to do when things change in the dungeon -- treasures are looted, monsters killed, etc. So the idea I had, which should help with both these issues, is the following: make a dungeon map as usual, but without numbering the rooms. Then scan the map and divide it into four quarters. Zoom each of these quarters up so that it fills a whole page, print these. 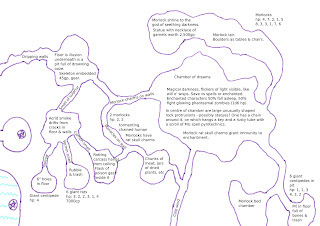 So you'll end up with one large scale map (at a normal scale of 10' per quarter inch, or whatever), which is the one you can stick to the back of your DM's screen for an overview of the level as a whole, and four zoomed in quarter maps. 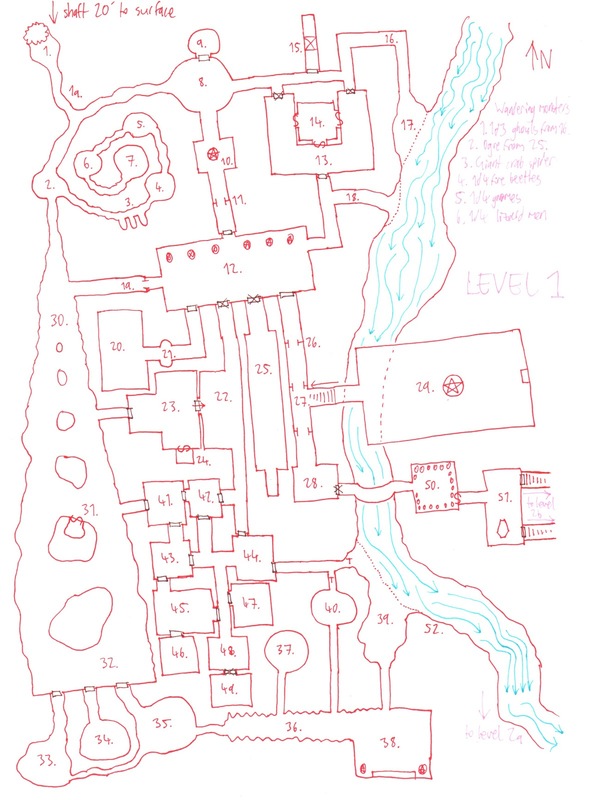 The descriptions of what's in the dungeon should be written straight onto the maps of the dungeon quarters, in pencil so it can be modified as the place is demolished by zealous adventurers. 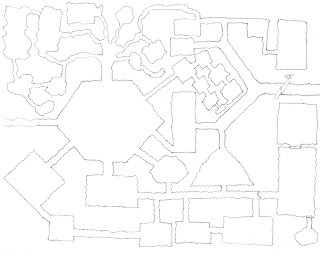 Here's an example dungeon quarter map I scanned in and quickly stocked to see how it works out. I wrote the key on this one digitally, for the sake of speed, in 12pt text (I think it's reasonable to be able to write legibly at that kind of size by hand). 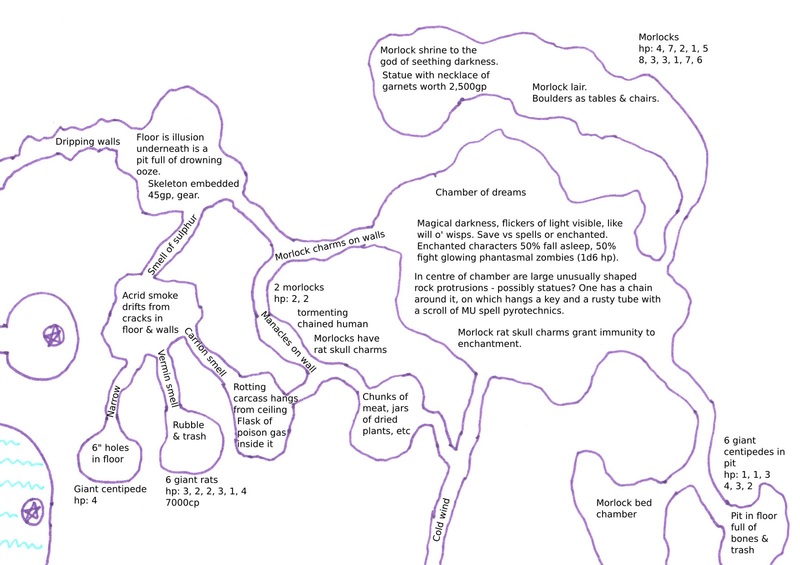 Of course it depends how much detail you want from your dungeon notes, but I find that for a self-written dungeon most of the work is done in the imagination, and I could totally run this example dungeon quarter purely from the minimal notes it contains. Note that there's also loads of blank space on that quarter, for more detailed descriptions if needed. I reckon this'd be a really nice way to work with dungeons, would enable quick & easy restocking / modifications to the dungeon in response to PC actions, and would encourage an anti-perfectionist attitude where the dungeon is a living play-aid, rather than a publishable document. I'm definitely gonna try this out for my next dungeon!